Glenda Saylor Sabin of Cherry Hill, NJ died March 14, 2019. Loving wife of the late James. Beloved mother of Jill (Michael) Casey of Cherry Hill, NJ. Wonderful grandmother of Laura Lopez of Woodbury, John Casey of Bellmawr, NJ, and Francisco, Jennifer (Luis), and Dani of Spain, and great-grandmother of Scarlett, Harper, and Hector. Glenda was predeceased by her husband James, son Jonathan, parents John and Virginia Saylor, grandson Connor Casey, and aunt and uncle Dale and Harry Swartz. She is also survived by her cousins Linda Parker and Bill Swartz and many wonderful friends. Glenda grew up in Somerset, PA, and graduated from West Penn Nursing School as an R.N. 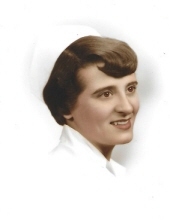 She worked as a nurse in various fields but her most fulfilling nursing was as a Labor & Delivery nurse at Garden State Hospital in Marlton, NJ, where she and her friends Virginia Cost and Jean Craig began delivering babies when the brand-new maternity unit opened. During her tenure at Garden State and later Virtua in Voorhees, she helped to deliver thousands of babies, including her first grandchild. Glenda was a long-time member of St. Andrew’s United Methodist Church in Cherry Hill, NJ, where a visitation with the family will be held Thursday, May 23 at 10:00am, followed by a memorial service to celebrate her life at 11:00am. In lieu of other expressions of sympathy, the family asks that donations be made to the Alzheimer’s Association, www.alz.org. To send flowers or a remembrance gift to the family of Glenda S. Sabin, please visit our Tribute Store. Guaranteed delivery before Glenda's gathering begins. Guaranteed delivery before Glenda's service begins. "Email Address" would like to share the life celebration of Glenda S. Sabin. Click on the "link" to go to share a favorite memory or leave a condolence message for the family.